We picked up a 60 year old table with poor veneer on it for about $450 at an antique shop. Over about a 3 month period, I built a new top using MDF and mahogany veneer. 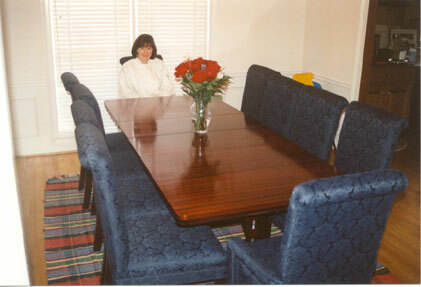 I also played around with wood dyes instead of stains, which were very nice to work with and allowed me to match the color of our existing chairs. Half of the new top and one of the leaves. 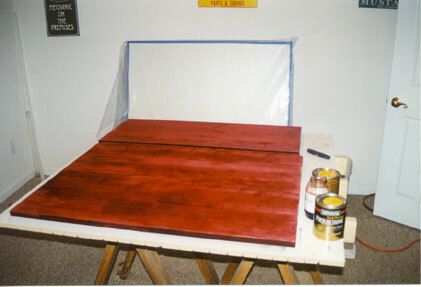 I used a vacuum veneer press (the white board with blue border against the wall). You can see the veneer press a bit better in this shot. New table with both leaves. I was very impressed with the wood dyes, as they produced excellent clarity and really brought out the grain in the veneer. 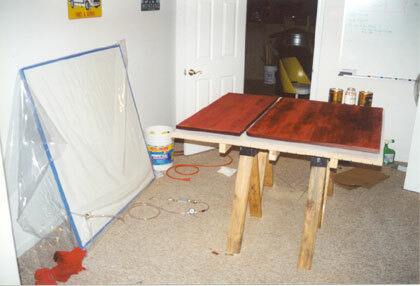 Over the next year, I returned the top to the basement several time and put another 20-30 coats of polyurethane on it trying to get the right amount of gloss. Turns out what I needed was a random-orbital sander just before the last coat.